1759. Mary Ruth "Ruth" BITLER 1 (Daniel Benjamin , Benjamin Israel , Mark , John , Johannes ) was born on 6 Jun 1898 in Turbotville, Northumberland Co, PA. She died on 30 Jul 1991 in Williamsport, Lycoming Co, PA. She was buried in Twin HIlls Memorial Park, Fairfield Twp, Lycoming Co, PA.
Ruth resided in 1900 in Pine Twp, Columbia Co, PA. She resided in 1910 in Pine Twp, Columbia Co, PA. She resided in 1920 in McNett Twp, Lycoming Co, PA. She resided in 1930 in 135 Montgomery St, Mongomery, Lycoming Co, PA. She was issued a social security number in PA.
Ruth married Albert Leon KENNEDY [scrapbook] 1, 2, son of Charles Moses KENNEDY and Jennie EVANS, on 26 Dec 1916 in Bloomsburg, Columbia Co, PA. Albert was born on 29 Dec 1894 in Jameson City, Columbia Co, PA. He died on 18 Sep 1973 in Williamsport, Lycoming Co, PA. He was buried on 21 Sep 1973 in Twin Hills Memorial Park, Fairfield Twp, Lycoming Co, PA.
Albert resided in 1920 in McNett Twp, Lycoming Co, PA. He worked as Laborer - Lumber Yard in 1920. He resided in 1930 in 135 Montgomery St, Mongomery, Lycoming Co, PA. He worked as Laborer - Funriture Factory in 1930. 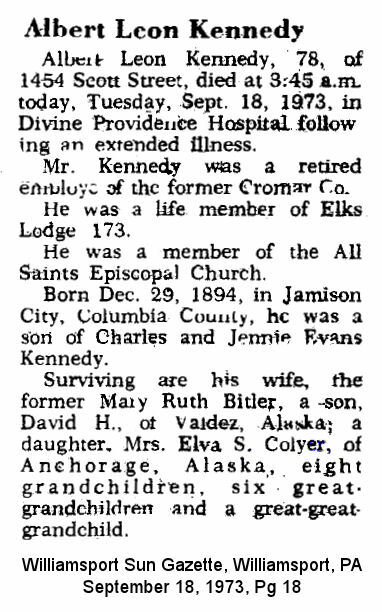 He was issued a social security number before 1951 in PA.
+ 4767 F i Elva Sevea KENNEDY. + 4768 M ii David Howard KENNEDY was born on 14 Dec 1920. He died on 19 Nov 1987. 1760. Fannie Elizabeth BITLER [scrapbook] 1 (Daniel Benjamin , Benjamin Israel , Mark , John , Johannes ) was born on 10 Jan 1900 in Millville, Greenwood Twp, Columbia Co, PA. She died on 5 Apr 1970 in Coatesville, Chester Co, PA.
Fannie resided in 1900 in Pine Twp, Columbia Co, PA. She resided in 1910 in Pine Twp, Columbia Co, PA. She resided in 1920 in 1618 Orange St, Berwick, Columbia Co, PA. She worked as Winder - Silk Mill in 1920. She resided in 1930 in Brinton Bridge Rd, Pennsbury, Chester Co, PA.
Fannie married George Washington ROBBINS [scrapbook] 1, son of Millard R ROBBINS and Viola J "Oley", on 31 May 1924 in Bloomsburg, Columbia Co, PA. George was born on 8 Apr 1900 in Unityville, Lycoming Co, PA. He died on 28 Nov 1972 in Coatesville, Chester Co, PA.
George resided in 1900 in Pine Twp, Columbia Co, PA. He resided in 1910 in Pine Twp, Columbia Co, PA. He resided in 1920 in Mifflin Twp, Columbia Co, PA. He worked as Spinner - Wool Mill in 1920. He resided in 1930 in Brinton Bridge Rd, Pennsbury, Chester Co, PA. He worked as Laborer - General Farm in 1930. He was issued a social security number in 1951 in PA.
+ 4769 M i Ellery Seymore ROBBINS Sr was born on 1 Nov 1924. He died on 5 Jan 2003. 1762. 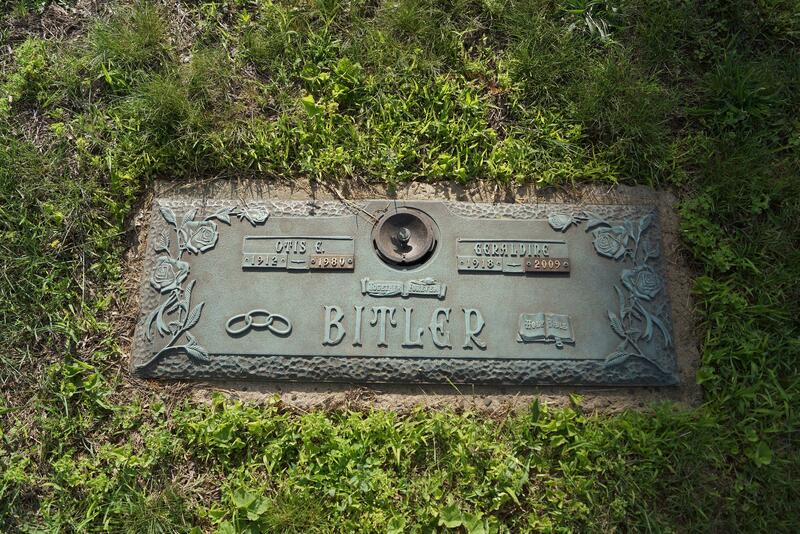 Pearl Mae BITLER [scrapbook] 1 (Daniel Benjamin , Benjamin Israel , Mark , John , Johannes ) was born on 2 May 1904 in Columbia Co, PA. She died on 18 May 1999 in Lycoming Co, PA. She was buried in Pine Center Cemetery, Pine Twp, Columbia Co, PA.
Pearl resided in 1910 in Pine Twp, Columbia Co, PA. She resided in 1920 in 1618 Orange St, Berwick, Columbia Co, PA. She resided in 1930 in Mount Pleasant Twp, Columbia Co, PA. She resided in 1935 in Greenwood Twp, Columbia Co, PA. She resided in 1940 in Greenwood Twp, Columbia Co, PA. She was issued a social security number before 1951 in PA. She resided in May 1999 in Williamsport, Lycoming Co, PA 17701. 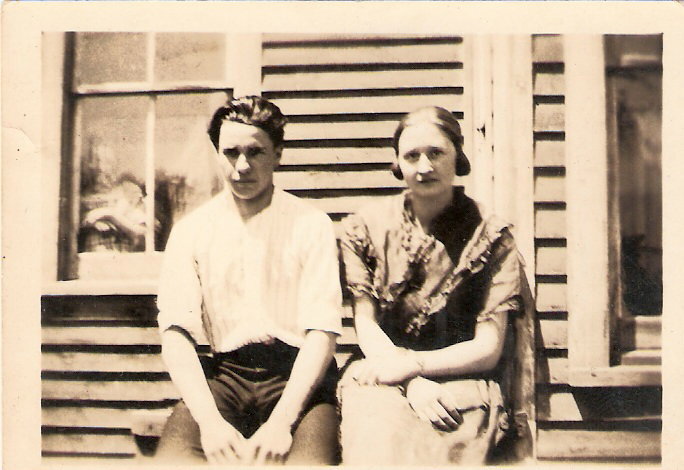 Pearl married Christian Frederick FAUSEY 1, son of Perry Hiram FAUSEY and Della P WATTS, about 1928. Christian was born on 17 May 1909 in Columbia Co, PA. 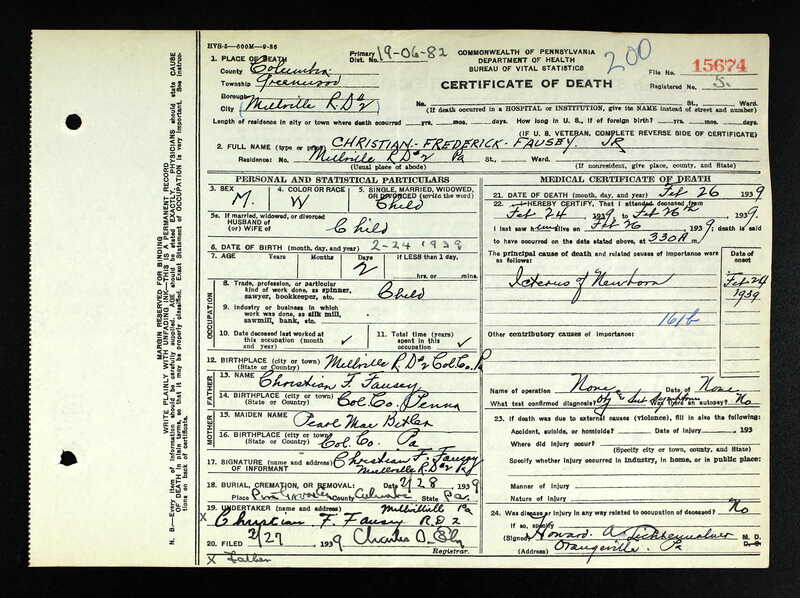 He died on 5 Apr 1998 in Montgomery, Lycoming Co, PA.
Christian resided in 1910 in Greenwood Twp, Columbia Co, PA. He resided in 1930 in Mount Pleasant Twp, Columbia Co, PA. He worked as Farm Laborer - General Farm in 1930. He resided in 1935 in Greenwood Twp, Columbia Co, PA. He resided in 1940 in Greenwood Twp, Columbia Co, PA. He worked as laborer - farm in 1940. He was issued a social security number before 1951 in PA. He resided in Apr 1998 in Montgomery, Lycoming Co, PA 17752. + 4770 F i Miriam B FAUSEY. Christian Frederick FAUSEY Jr. [scrapbook] was born on 24 Feb 1939 in RD 2 Millville, Columbia Co, PA. He died on 26 Feb 1939 in Greenwood Twp, Columbia Co, PA. 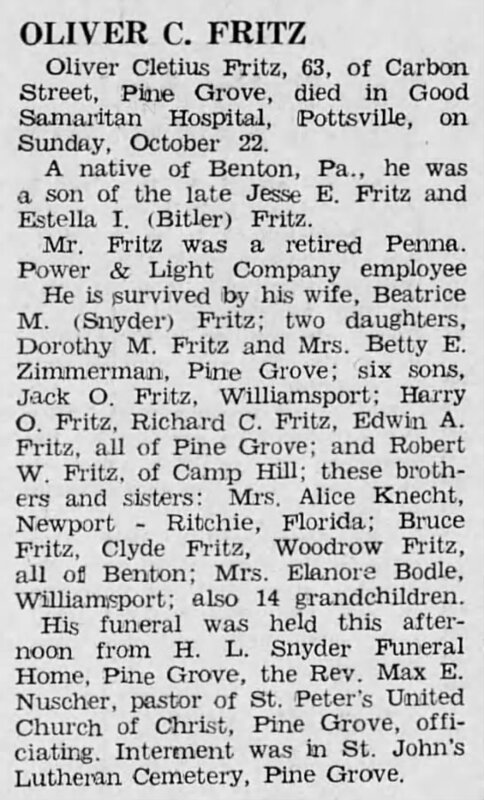 He was buried on 28 Feb 1939 in Pine Grove Cemetery, Columbia Co, PA.
1763. Freda Daisy BITLER [scrapbook] 1 (Daniel Benjamin , Benjamin Israel , Mark , John , Johannes ) was born on 4 Feb 1906 in Pine Twp, Columbia Co, PA. She died on 27 Feb 1987 in Millville, Columbia Co, PA.
Freda resided in 1910 in Pine Twp, Columbia Co, PA. She resided in 1920 in 1618 Orange St, Berwick, Columbia Co, PA. She resided in 1930 in Walnut St, Millville, Columbia Co, PA. She resided in 1940 in Main St, Millville, Columbia Co, PA.
Freda married Milton George POUST [scrapbook] 1, son of Samuel Wilson POUST and Margaret YOUNG, on 22 Mar 1923 in Columbia Co, PA?. Milton was born on 20 Jun 1905 in PA. He died in Jan 1978 in Millville, Columbia Co, PA.
Milton resided in 1930 in Walnut St, Millville, Columbia Co, PA. He worked as Truck Driver - Lumber Yard in 1930. He resided in 1940 in Main St, Millville, Columbia Co, PA. He was issued a social security number in PA. He resided in Jan 1978 in Millville, Columbia Co, PA.
+ 4772 F i Donna E POUST was born on 29 Sep 1924. She died on 18 Mar 2006. James Arthur POUST [scrapbook] was born on 8 Oct 1926 in PA. He died on 24 Sep 1956. 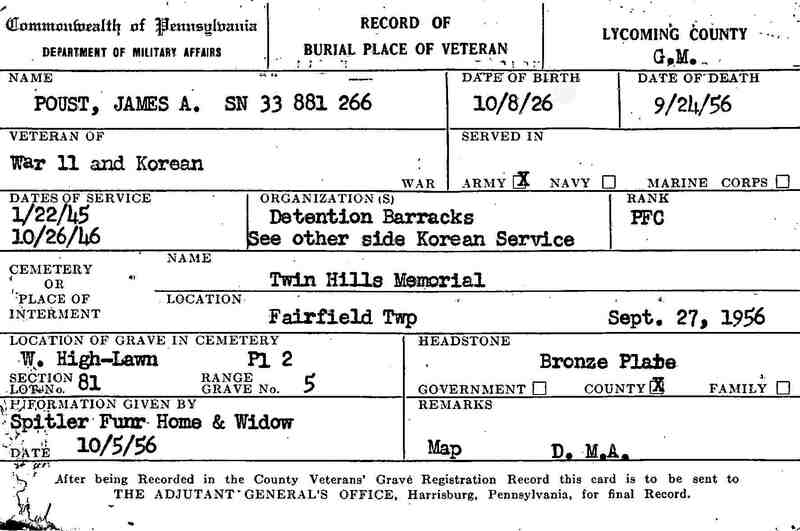 He was buried on 27 Sep 1956 in W High Lawn Pl 2 Lot 81 Gr 5, Twin Hills Memorial Park, Fairfield Twp, Lycoming Co, PA.
James resided in 1930 in Walnut St, Millville, Columbia Co, PA. He resided in 1940 in Main St, Millville, Columbia Co, PA. He served in the military with U S Army from 22 Jan 1945 to 26 Oct 1946 in WW II. He served in the military with Private First Class in Korea. 4774 F iii Doris M POUST. Doris also married [Male] LATHROP. + 4775 M iv Ralph G POUST. 4776 M v [Male] POUST. 1765. Howard Edward BITLER [scrapbook] 1 (Daniel Benjamin , Benjamin Israel , Mark , John , Johannes ) was born on 17 Apr 1909 in Millville, Greenwood Twp, Columbia Co, PA. He died on 6 Mar 1978 in Millville, Greenwood Twp, Columbia Co, PA. He was buried in Chapel Lawn, Elan Memorial Park, Lime Ridge, Columbia Co, PA.
Howard resided in 1910 in Pine Twp, Columbia Co, PA. He resided in 1920 in 1618 Orange St, Berwick, Columbia Co, PA. He resided in 1930 in Iola, Greenwood Twp, Columbia Co, PA. He worked as Farm Laborer - General Farm in 1930. He resided in Nov 1933 in Montgomery, Lycoming Co, PA. He worked as laborer in Nov 1933. He was issued a social security number before 1951 in PA. He worked as road supervisor in Greenwood Twp, Columbia Co, PA. He resided in Mar 1978 in Millville, Columbia Co, PA.
Howard married 1 Blanche E CHAMBERS [scrapbook], daughter of George H CHAMBERS, on 23 Nov 1933 in New London, Chester Co, PA. Blanche was born on 1 Sep 1914 in Lancaster Co, PA. She died in Jun 1979 in Bloomsburg Hospital, Bloomsburg, Columbia Co, PA. She was buried in Elan Memorial Park, Lime Ridge, Columbia Co, PA.
Blanche was issued a social security number in PA. She resided in Nov 1933 in Lincoln University, Chester Co, PA. She resided in Jun 1979 in Millville, GReenwood Twp, Columbia Co, PA.
+ 4777 M i Donald Howard BITLER. + 4778 F ii Louise BITLER. 1767. 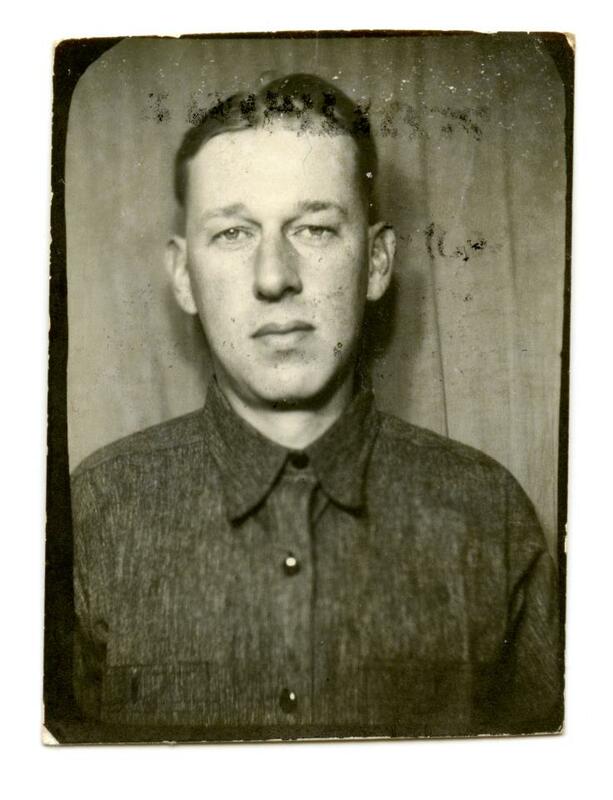 Otis Ellery BITLER [scrapbook] 1, 2 (Daniel Benjamin , Benjamin Israel , Mark , John , Johannes ) was born on 14 Oct 1912 in Millville, Greenwood Twp, Columbia Co, PA. He died on 23 Nov 1980 in Millville, Greenwood Twp, Columbia Co, PA. He was buried on 26 Nov 1980 in Chapel Lawn, Elan Memorial Park, Lime Ridge, Columbia Co, PA.
Otis resided in 1920 in 1618 Orange St, Berwick, Columbia Co, PA. He resided in 1930 in Iola, Greenwood Twp, Columbia Co, PA. He resided in 1940 in 325 Cherry St, Montoursville, Lycoming Co, PA. He worked as laborer - venetian blind factory in 1940. He was issued a social security number before 1951 in PA. He resided in Nov 1980 in Millville, Columbia Co, PA.
Otis married Geraldine Mildred KNORR [scrapbook], daughter of Stanley E KNORR and Estella ECKROTH, in 1935. Geraldine was born on 24 Jul 1918 in Briar Creek Twp, Columbia Co, PA. She died on 31 Mar 2009 in Bloomsburg, Columbia Co, PA. She was buried in Chapel Lawn, Elan Memorial Park, Lime Ridge, Columbia Co, PA.
Geraldine resided in 1920 in Mountain Rd, Briar Creek Twp, Columbia Co, PA. She resided in 1940 in 325 Cherry St, Montoursville, Lycoming Co, PA. She resided in Sep 2006 in Millville, Columbia Co, PA.
+ 4779 F i Barbara Yvonne BITLER. + 4780 M ii Paul Otis BITLER. + 4781 F iii Phyllis Ileane BITLER. + 4782 F iv Joan Arlene BITLER. + 4783 M v Dennis Ellery BITLER. 4784 M vi Gerald Knorr BITLER. Gerald married Patricia Jeanne BREMIGEN. Gerald also married Jennifer Lee ANDY. + 4785 F vii Carol Adella BITLER. 4786 F viii Janice Beth BITLER. Janice also married Charles LAPHEN. 1768. Alice Catherine FRITZ 1, 2, 3, 4 (Estella Esther BITLER , Benjamin Israel , Mark , John , Johannes ) was born on 8 Feb 1900 in Columbia Co, PA. She died on 25 Nov 1987 in Pasco Co, FL. She was buried in West Elfers Cemetery, Elfers, Pasco Co, FL. Alice resided in 1910 in Columbia Co, PA. She graduated from Benton High School in 1918. 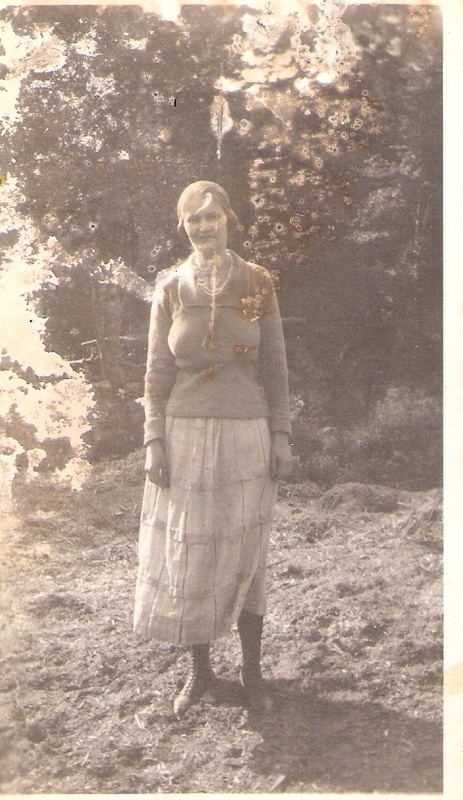 She resided in 1920 in Sugarloaf Twp, Columbia Co, PA. She worked as Teacher - Public School in 1920. She resided in 1940 in RD 1 Montourseville, Lycoming Co, PA. She resided in 1949 in Montoursville, Lycoming Co, PA. She resided in Oct 1967 in New Port Richey, FL. Alice married Maurice E. KNECHT 1, 2, 3. Maurice was born in 1899 in PA. He died in Sep 1964 in Pasco Co, FL. He was buried in West Elfers Cemetery, Elfers, Pasco Co, FL. Maurice resided in 1940 in RD 1 Montourseville, Lycoming Co, PA. He worked as refridgeration contractor - electric refridgerators (own business) in 1940. + 4787 F i Florence E KNECHT was born on 5 Sep 1921. She died on 12 Feb 2017. Robert KNECHT 1 was born about 1927. He died before 2017. Robert resided in 1940 in RD 1 Montourseville, Lycoming Co, PA.
4789 F iii Doris Doty KNECHT. Gloria Louise KNECHT [scrapbook] was born on 23 Jan 1929 in PA. She died on 23 Mar 1938 in Montoursville, Lycoming Co, PA. She was buried on 25 Mar 1938 in Montoursville Cemetery, Montoursville, Lycoming Co, PA.
Gloria resided in Mar 1938 in 354 Cherry St, Montoursville, Lycoming Co, PA. The cause of her death was Rheumatic Fever. Barbara KNECHT 1 was born about 1935 in PA. She died before 2017. Barbara resided in 1940 in RD 1 Montourseville, Lycoming Co, PA.
Nancy KNECHT 1 died before 2017. 1769. 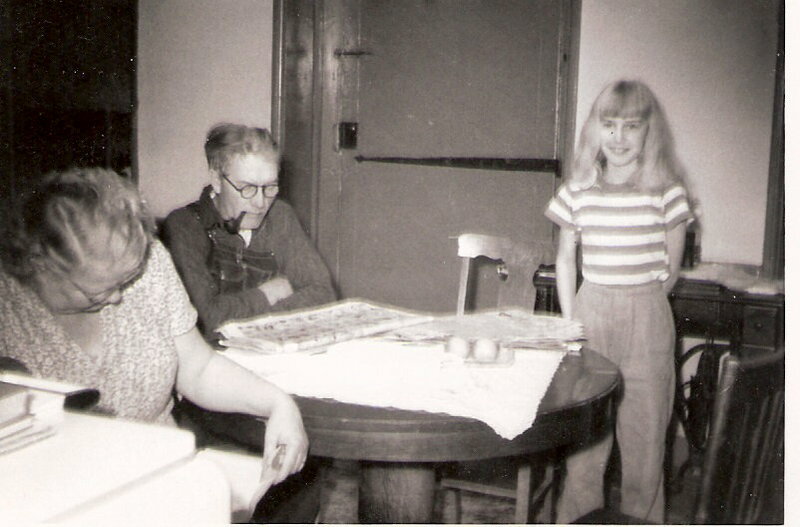 Bruce I FRITZ [scrapbook] 1, 2, 3 (Estella Esther BITLER , Benjamin Israel , Mark , John , Johannes ) was born on 9 Apr 1902 in PA. He died in Feb 1973 in Benton, Columbia Co, PA. He was buried in Benton Cemetery, Benton, Columbia Co, PA.
Bruce resided in 1910 in Columbia Co, PA. He resided in 1920 in Sugarloaf Twp, Columbia Co, PA. He worked as Laborer - ? in 1920. He resided in 1930 in Center St, Benton, Columbia Co, PA. He worked as Laborer - Service Station in 1930. He resided in 1940 in Benton, Columbia Co, PA. He worked as manager with gasoline filling station in 1940. He resided in 1949 in Benton, Columbia Co, PA. He was issued a social security number before 1951 in PA. He resided in Oct 1967 in Benton, Columbia Co, PA.
Bruce married Mary Etta WHITE [scrapbook] 1 about 1920 in Columbia Co, PA?. Mary was born on 3 Apr 1902 in NY. She died in Dec 1986 in Benton, Columbia Co, PA. She was buried in Benton Cemetery, Benton, Columbia Co, PA.
Mary resided in 1930 in Center St, Benton, Columbia Co, PA. She resided in 1940 in Benton, Columbia Co, PA. She was issued a social security number in 1958/1960 in PA.
+ 4793 F i Ruth FRITZ. 1770. Oliver C FRITZ [scrapbook] 1, 2, 3 (Estella Esther BITLER , Benjamin Israel , Mark , John , Johannes ) was born on 12 Aug 1904 in Benton, Columbia Co, PA. He died on 22 Oct 1967 in Good Samaratin Hospital, Pottsville, Schuylkill Co, PA. He was buried in St. John's Lutheran Church Cemetery, Pine Grove, Schuylkill Co, PA.
Oliver resided in 1910 in Columbia Co, PA. He resided in 1920 in Sugarloaf Twp, Columbia Co, PA. He worked as Farm Laborer in 1920. He resided in 1930 in 133 Hepburn St, Williamsport, Lycoming Co, PA. He worked as Laborr - Power & Light Co (not working) in 1930. He resided in 1940 in 14 Carbon St, Pine Grove, Schuylkill Co, PA. He worked as operator with power and light company in 1940. 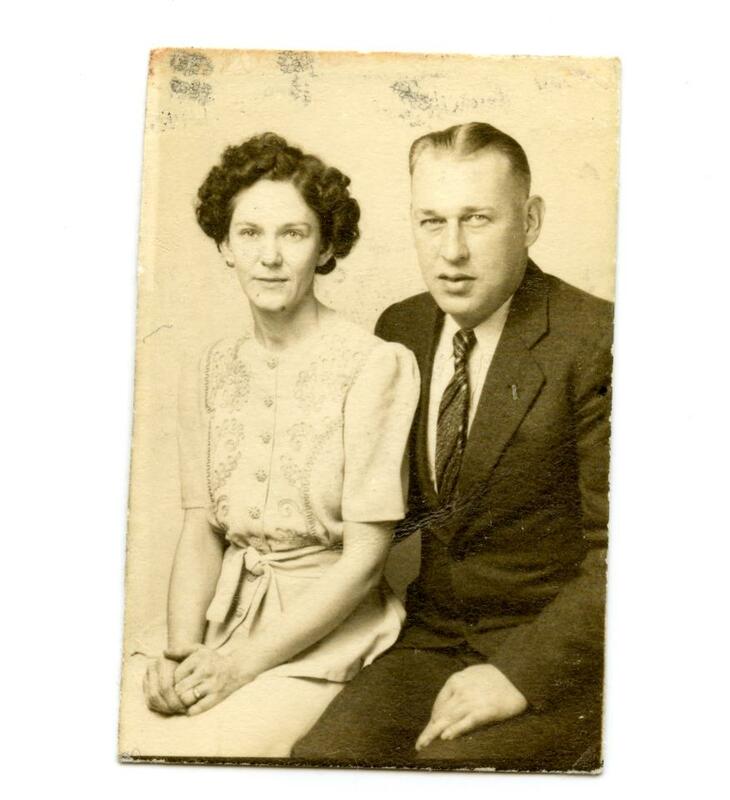 He resided in 1949 in Pine Grove, PA.
Oliver married Beatrice May SNYDER 1 about 1923 in PA. Beatrice was born on 17 Mar 1899 in PA. She died on 18 May 1988. 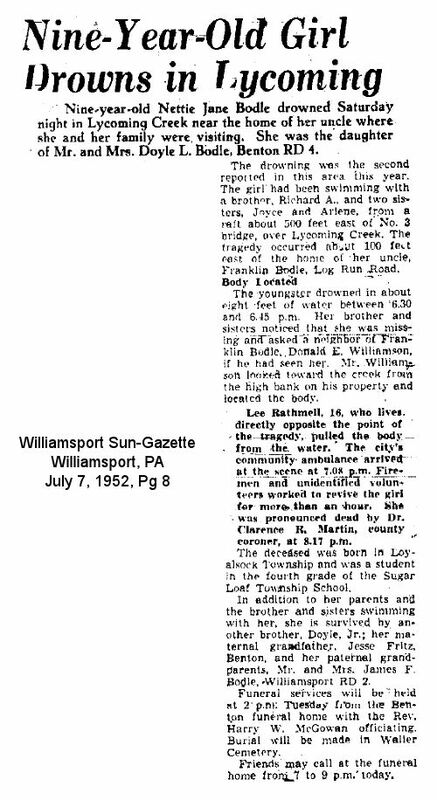 Beatrice resided in 1930 in 133 Hepburn St, Williamsport, Lycoming Co, PA. She resided in 1940 in 14 Carbon St, Pine Grove, Schuylkill Co, PA.
Jack O FRITZ 1 was born on 1 Feb 1920 in Williamsport, Lycoming Co, PA. He died on 8 Feb 1997. He was buried in Montoursville Cemetery, Montoursville, Lycoming Co, PA.
Jack resided in 1930 in 133 Hepburn St, Williamsport, Lycoming Co, PA. He resided in 1940 in 14 Carbon St, Pine Grove, Schuylkill Co, PA. He worked as operator - silk mill in 1940. He served in the military with U.S. Army - Private - HQ Btry 44th FA from 3 Apr 1942 to 27 Aug 1942 in WW II. 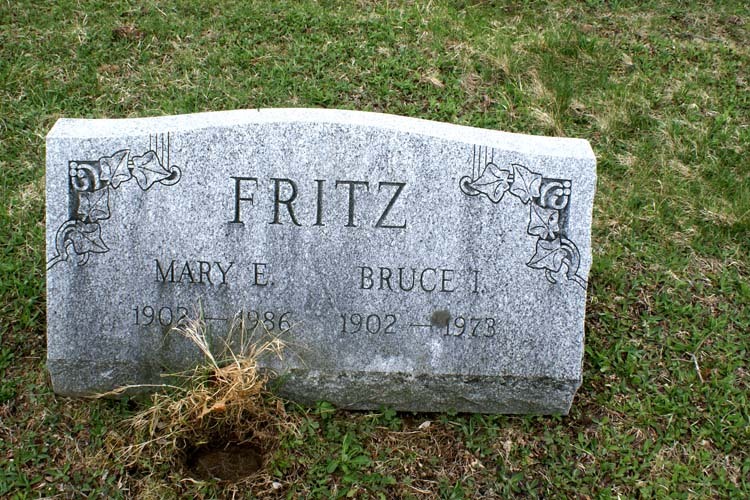 He resided in Oct 1967 in Williamsport, Lycoming Co, PA.
4795 F ii Dorothy M FRITZ. Harry Oliver FRITZ 1 was born on 18 Feb 1927 in Williamsport, Lycoming Co, PA. He died on 1 Jul 1995 in Pine Grove, Schuylkill Co, PA.
Harry resided in 1930 in 133 Hepburn St, Williamsport, Lycoming Co, PA. He resided in 1940 in 14 Carbon St, Pine Grove, Schuylkill Co, PA. 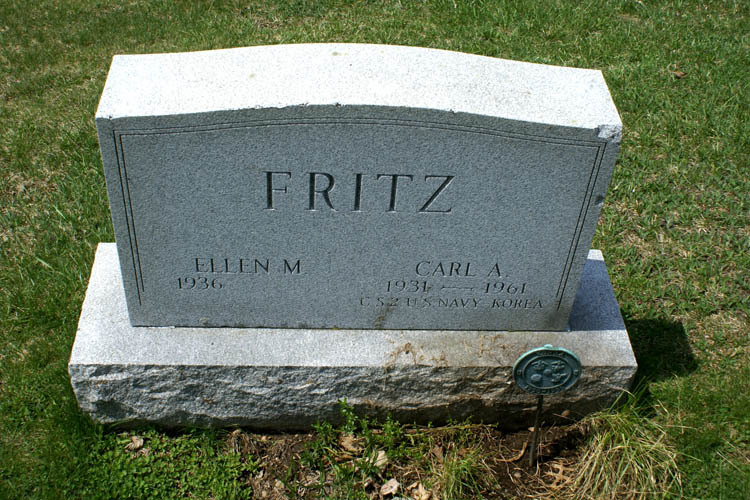 He resided in Oct 1967 in Pine Grove, Schuylkill Co, PA.
4797 M iv Richard C FRITZ. 4798 M v Edwin A FRITZ. 4799 M vi Robert W FRITZ. 4800 F vii Betty E FRITZ. 1771. Clyde Larue FRITZ [scrapbook] 1, 2, 3, 4, 5, 6 (Estella Esther BITLER , Benjamin Israel , Mark , John , Johannes ) was born on 1 Jul 1906 in Sugarloaf Twp, Columbia Co, PA. He died on 18 Mar 1994 in Benton, Columbia Co, PA. He was buried in Benton Cemetery, Benton, Columbia Co, PA.
Clyde resided in 1910 in Columbia Co, PA. He resided in 1920 in Sugarloaf Twp, Columbia Co, PA. He resided in 1930 in 2208 Boyd St, Williamsport, Lycoming Co, PA. He worked as Laborer - Foundry in 1930. He resided in 1940 in Benton, Columbia Co, PA. 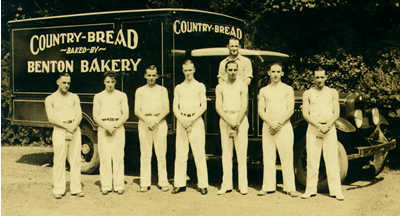 He worked as baker - bakery in 1940. He resided in 1949 in Benton, Columbia Co, PA. He was issued a social security number before 1951 in PA. He resided in Oct 1967 in Benton, Columbia Co, PA.
Clyde married Annabelle V BACHMAN [scrapbook] 1, 2, 3, 4 about 1927 in Columbia Co, PA?. Annabelle was born on 10 Aug 1908 in PA. She died on 21 Nov 1990 in Columbia Co, PA?. She was buried in Benton Cemetery, Benton, Columbia Co, PA.
Annabelle resided in 1930 in 2208 Boyd St, Williamsport, Lycoming Co, PA. She resided in 1940 in Benton, Columbia Co, PA. She was issued a social security number before 1951 in PA.
+ 4801 F i Norma A FRITZ was born on 14 Jan 1928. She died on 31 Dec 2000. + 4802 M ii Rev Clyde Larue FRITZ was born on 4 Apr 1930. He died on 28 Aug 2006. Carl A FRITZ [scrapbook] 1, 2 was born in 1931 in PA. He died in 1961. He was buried in Benton Cemetery, Benton, Columbia Co, PA.
Carl resided in 1940 in Benton, Columbia Co, PA. He served in the military with U.S. Navy - C. S. 2 in Korea. + 4804 M iv Mahlon Lee FRITZ Sr was born on 24 Mar 1934. He died on 25 Mar 2011. + 4805 M v Robert A FRITZ was born on 26 Feb 1935. He died on 8 Mar 2003. 4806 M vi Jerry D FRITZ. 1772. Woodrow Jesse FRITZ 1, 2, 3, 4 (Estella Esther BITLER , Benjamin Israel , Mark , John , Johannes ) was born on 6 Jan 1913 in Sugarloaf Twp, Columbia Co, PA. He died on 30 Mar 1998 in Benton, Columbia Co, PA. He was buried on 2 Apr 1998 in Waller Cemetery, Waller, Jackson Twp, Columbia Co, PA.
Woodrow resided in 1920 in Sugarloaf Twp, Columbia Co, PA. He resided in 1930 in Sugarloaf Twp, Columbia Co, PA. He worked as None in 1930. He resided in 1940 in Benton Twp, Columbia Co, PA. He worked as time keeper with W.P.A. in 1940. He resided in 1949 in Benton, Columbia Co, PA. He was issued a social security number before 1951 in PA. He was a member of Benton United Methodist Church. He resided in Oct 1967 in Benton, Columbia Co, PA.
Woodrow married Alice Amanda BUTLER 1, 2. Alice was born on 15 Apr 1914. She died on 16 Jun 1987 in Benton, Columbia Co, PA. She was buried in Waller Cemetery, Waller, Jackson Twp, Columbia Co, PA.
Alice resided in 1940 in Benton Twp, Columbia Co, PA. She was issued a social security number before 1951 in PA.
+ 4807 F i Beverly J FRITZ. + 4808 M ii Jesse E FRITZ was born on 3 Apr 1933. He died on 14 Jun 2018. William W FRITZ 1, 2 was born on 9 Jan 1932 in PA. He died on 5 Dec 2001 in PA. He was buried in Benton Cemetery, Benton, Columbia Co, PA.
William resided in 1940 in Benton Twp, Columbia Co, PA. He was issued a social security number before 1951 in PA. 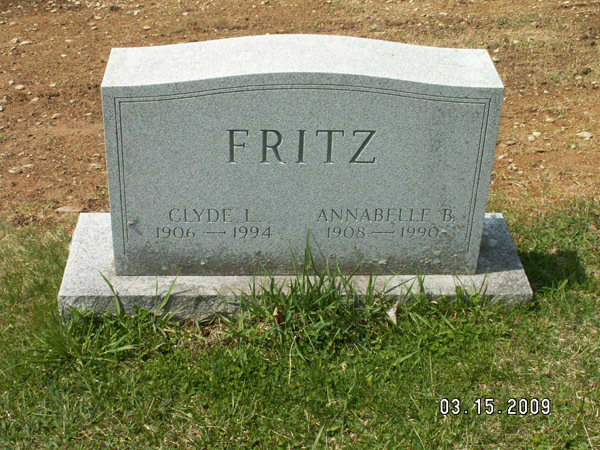 He resided in Dec 2001 in Benton, Columbia Co, PA.
4810 F iv Margaret FRITZ. Margaret married John L SCHUPP Jr. John was born on 12 Aug 1932. He died on 20 Aug 2001. 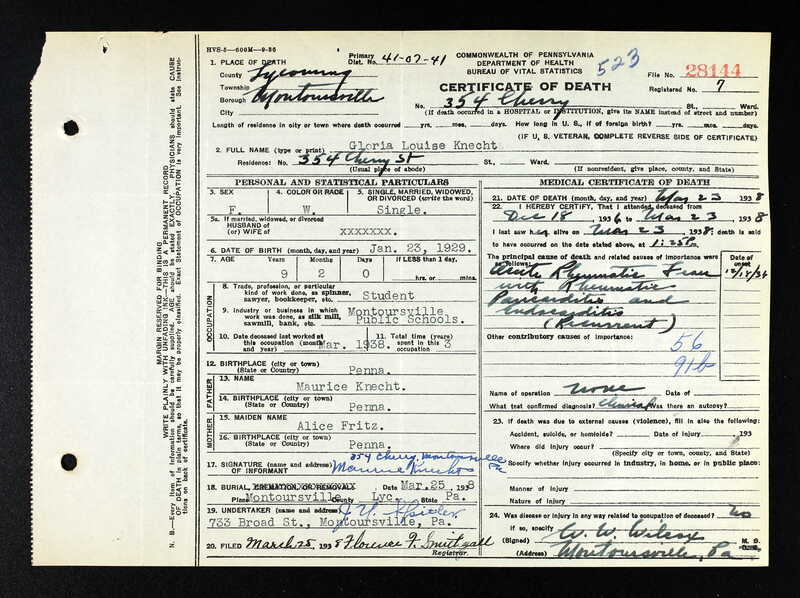 He was buried in Benton Cemetery, Benton, Columbia Co, PA.
John was issued a social security number before 1951 in PA. He resides in Aug 2001 in Benton, Columbia Co, PA.
1773. Eleanor C FRITZ 1, 2, 3, 4, 5 (Estella Esther BITLER , Benjamin Israel , Mark , John , Johannes ) was born on 6 Jan 1913 in Benton, Columbia Co, PA. She died on 20 Mar 1980 in Williamsport, Lycoming Co, PA.
Eleanor resided in 1920 in Sugarloaf Twp, Columbia Co, PA. She resided in 1949 in RD Benton, Columbia Co, PA. She resided in Oct 1967 in Williamsport, Lycoming Co, PA.
Eleanor married Doyle Leroy BODLE Sr 1, 2, 3, 4, 5, son of James Franklin BODLE and Virginia Lillian LANNAN. Doyle was born on 27 Sep 1913 in PA. He died on 11 Nov 1978 in Williamsport, Lycoming Co, PA.
Doyle resided in 1920 in Flemmington, Clinton Co, PA. He was issued a social security number before 1951 in PA.
+ 4811 M i Richard A BODLE Sr was born on 26 Oct 1938. He died on 12 Jul 2008. + 4812 F ii Joyce Lillian BODLE was born on 24 Jan 1940. She died on 10 Jan 2004. + 4813 F iii Arlene Stella BODLE. Nettie Jane BODLE [scrapbook] 1 was born about 1943 in Loyalsock Twp, Lycoming Co, PA. She died on 5 Jul 1952 in Lycoming Co, PA. She was buried on 8 Jul 1952 in Waller Cemetery, Waller, Jackson Twp, Columbia Co, PA.
4815 M v Doyle Leroy BODLE Jr.